Thanks to my Bermese Chinese friend Amy, I get to try many kinds of delicious Bermese food, especially the ones you won’t even find in a Bermese restaurant. This spicy tomato sambal is just one of them. It looks very much like sambal chili sauce, except it’s mostly tomatoes. Amy told me that in Myamar, people eat it with fresh cucumber. I tried it and it was really good– the spiciness matches very well with the refreshing cucumber, kinda fire and ice in every bite. Besides cucumber, I think this sambal is also great on steamed rice, tortilla chips, keropok (shrimp or fish crackers), or even mee siput (Malaysian crispy noodle snack)! Put fresh and canned tomatoes in a food processor, pause blend briefly so that the tomatoes still have some texture. Set aside. In a deep pot pour in half of 1/2 cup of oil, and turn up to high heat. Fry garlic, shallots, dried shrimps and balachan until flavors come out. Add in peppers, fry for a few more minutes. Add in remaining half of the oil and tomatoes. Stir to mix well with a wooden spoon (you can leave the spoon in the pot the entire time without it getting hot). Uncovered, cook on high heat (stirring every 10 minutes or so) until the liquid reduces to 1/3 and the sauce thickens (this is a long process, it took me about 1.5 hours). At this point, keep a close eye on the sambal. Turn down heat to medium and stir frequently (about 5 minute interval, about 20-30 minutes total)) until the sambal thickens further (test: when you run the spoon across the bottom of the pot, the sambal doesn’t come together. Also, oil starts separated from tomatoes). Add cilantro and salt to taste. Stir a few times. Remove and cool completely before dividing into batches. Store in air tight containers, in the refrigerator. The sambal should keep for at least 10 days. To keep it longer store in the freezer. 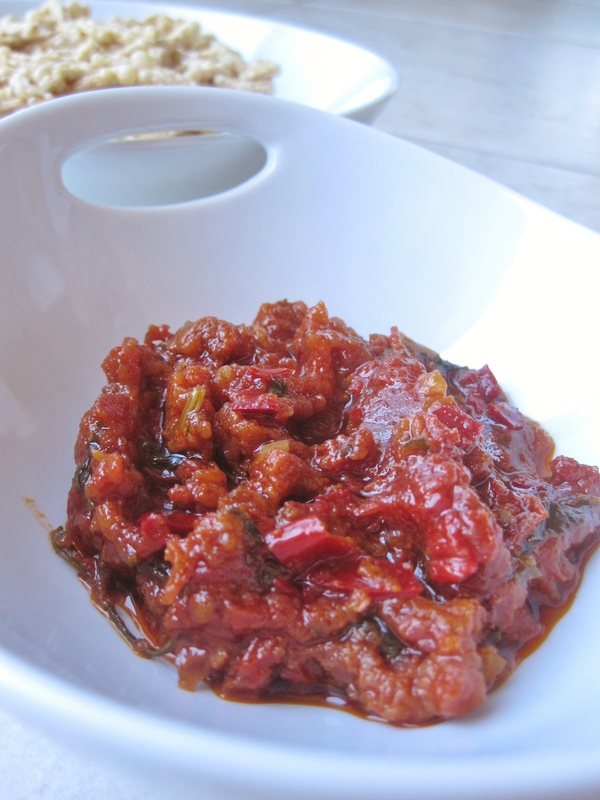 Just like regular sambal chili sauce, this tomato sambal can be kept frozen. I like to make extras, divide into small ziplog bags (air tight) and freeze for later use.